We have spent the last weekend in Munich enjoying time with our German friends Elfi and Stefan, and their son Stefan. 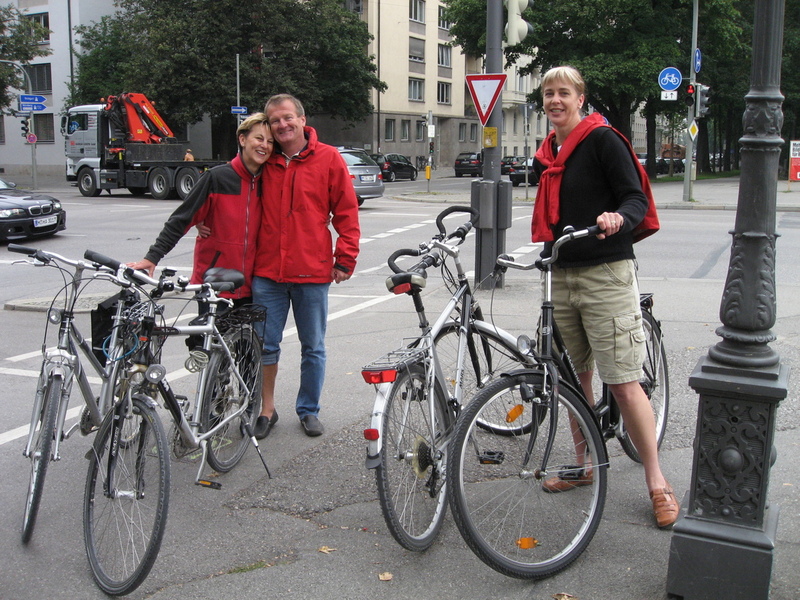 They were nice enough to arrange for a couple of bicycles for Joycelyn and I, and on Friday afternoon they led us on a 30km tour of Munich and the Isar river. We rode from their house near the Rotkreutzplatz across town and down the river to the Waldwirtschaft Biergarten in Großhesselohe. Elfi and Stefan were married in one of the banquet halls here, so it holds a special place in their heart. It is a beautiful setting nestled on the west bank of the Isar up above the river. We had a couple beers there and ate a small lunch. I think most Americans expect great beer from Bavarian Biergartens, but what many don't realize is that the food is also consistently excellent. The proprietors take great pride in serving the freshest beer, and serving high quality, traditional dishes. Our lunch was excellent. The Waldwirtschaft is usually packed with a jazz band playing in the center, but this day the crowds were kept down due to the cloudy weather and a brief rain shower. Our timing was perfect since we were under an awning enjoying our second beer during the shower. 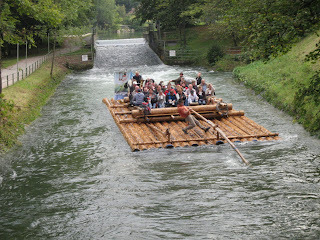 On the way back to the Rotkreutzplatz, we saw several floats drifting down the Isar. I've included a picture so you can get a feel for what they look like. 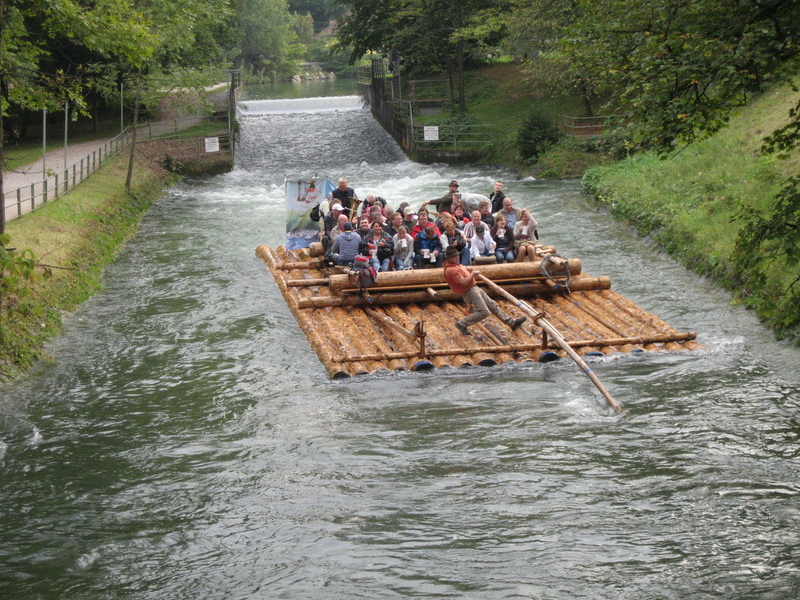 They are flat log rafts (that are broken down for their truck ride back up the river) with a couple of guides, Blasmusik (um pa pa bands) and of course plenty of beer on board. Everyone appeared to be having a great time - and it is something I'd like to come back and do some day. The Isar flows chalky-white through Munich north toward the Danube river. It was interesting to get up and close to one of the beer world's most famous rivers! Its highly carbonate water is perfectly suited for brewing the dark, malty and clean lagers that Munich is famous for. I think this water is one of the secret ingredients that makes it impossible to brew copies of Munich's wonderful beers in other parts of the world. There are many great Dunkles and Bock beers brewed in America, but none quite match the originals. Munich is a very bicycle friendly city, and it is easy to find stores that rent them. So if you get the chance, get off the beaten path of the old town and ride around a little. And I recommend the trip south down to the Waldwirtschaft Biergarten in Großhesselohe - down the peaceful Isar bicycle route. And we have to give a big thanks to Elfi and Stefan for being such great hosts and showing some new parts of Munich. Wow, it looks like you guys are having a great time! I'm looking forward to seeing your pictures and hearing more about the trip.